Groups like OTR were taking ICCA performances to another level, long before others did. If you look at ICCA (International Championship of Collegiate A Cappella) sets from last year compared to the previous 5-10 years you'll see that they have really undergone a major transition. While once upon a time 3 song sets featuring your best soloists belting out hour-long notes may have worked in the past, the format has shifted to judges craving creative story arcs told by the human voice. ICCA sets must have purpose. Not only this, but they must be original, entertaining and give the audience something they cannot get from a studio album. Well, if we go back a little further, say 15 years, we can see that groups like University of Oregon's On The Rocks (OTR) were already ahead of the game with what they were dishing out. 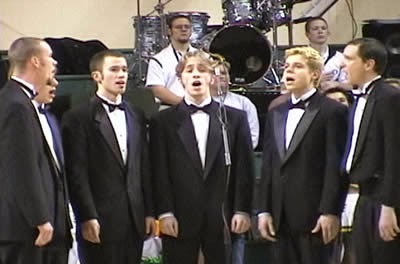 In 2002, OTR advanced all the way to the ICCA Finals, placing second behind BYU's Vocal Point. In one of the standout moments of the group's ICCA run came an original opening that has yet to be replicated. OTR's vocal percussionist assumes the role of DJ and uses the group as a live record....vocal scratching included. It's moments like this #TBT that groups should look to when thinking of ways to be unique during competition season.